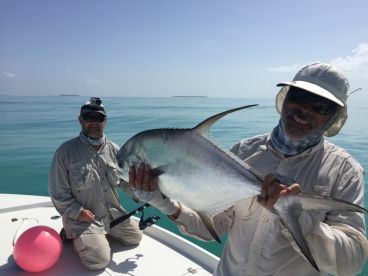 One of the most intelligent and trickiest fish to catch, especially on the fly, Permit requires patience and an experimental nature from anglers. 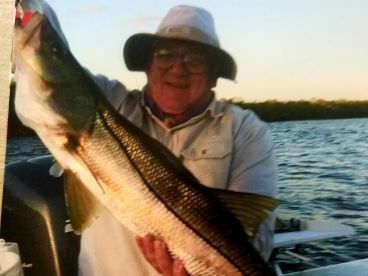 Boating this fish significantly contributes to angling experience and, if you choose so, the dinner table, too. 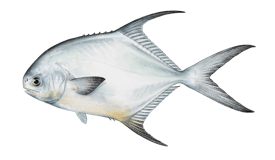 Permit can be thought of as overgrown Pompano. 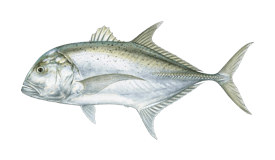 They're very similar in looks, the main differentiators being Pompano's two protruding rib bones and that they're at least a couple of times smaller than their bulky cousins. 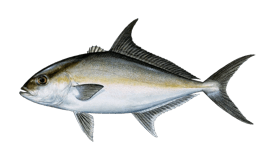 Permit are schooling (occasionally in great numbers, but solitary when older) and mostly present in the flats, though the abundance of food around reefs and wrecks up to 100ft deep is known to bring them into the ocean. 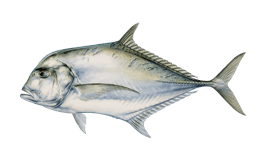 Permit can reach a whopping 50'' and weigh as much as 60lbs. 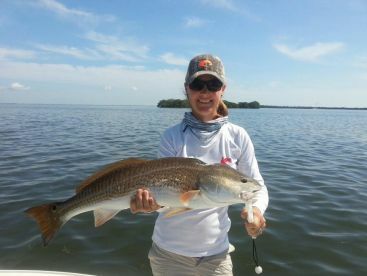 Most catches will be in the 10 to 30lbs range, but fish over 40lbs aren't uncommon. 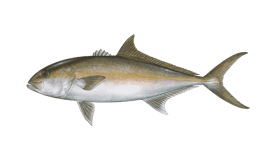 This species is native to western Atlantic waters, as far north as Massachusetts, and as far south as Brazil (where the record fish was caught). This includes the Gulf of Mexico and the West Indies. 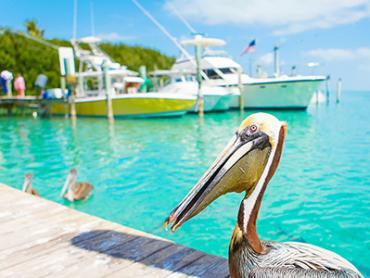 The highest concentrations and largest specimens of Permit will be found off the Atlantic coast of Florida, especially in and south of Biscayne Bay and in the Keys. 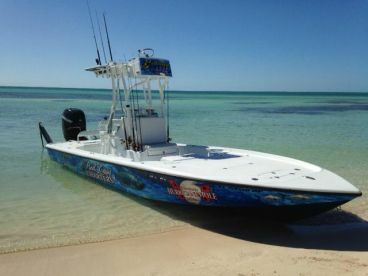 The Gulf coast sees them 25-50 miles off the shore around reefs and wrecks, in certain (secret) freshwater springs from Marco Island to Boca Grande, but also abundantly inside Tampa Bay. 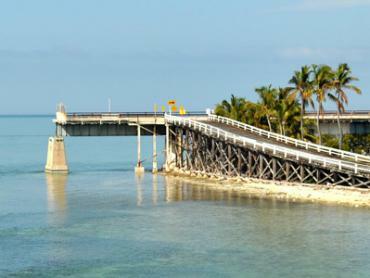 Belize is the most popular out of country destination, with plenty of flats fish to accommodate a Grand Slam. 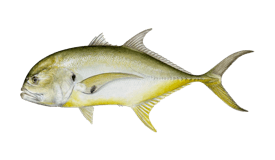 Finding Permit is very dependent on timing - late April to November during new and full moons is the optimal time frame, with the highest concentrations at the beginning and end of this interval. Additionally, Permit like windy conditions, specifically, when the wind is blowing towards the coast. As for the time of day, early morning and late afternoon work well. No, you don't need a special permit to catch Permit. 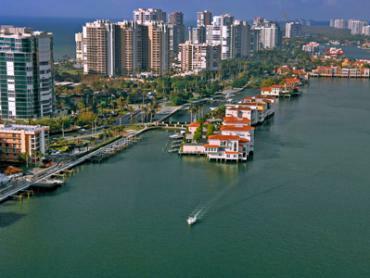 That is, if you get a charter in Florida! If sight casting in the flats, look for mudding Permit, as they will be the most cooperative. 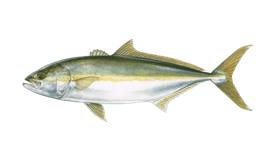 The bait should be cast a few feet behind the fish and allowed to sink. Then it should be retrieved across the surface and, as soon as the Permit spots it and starts going after it, allowed to sink back down. 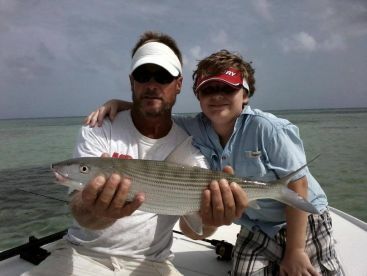 This should cause a bite and a similar technique is used when fishing on the fly. 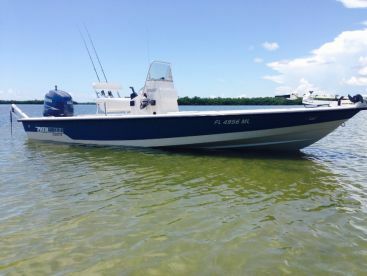 If fishing deeper waters, it is recommended to anchor upcurrent and either do plain bottom fishing / deep jigs (white jig with a small piece of shrimp) or chum with shrimp and then let your bait float downcurrent in free spool. 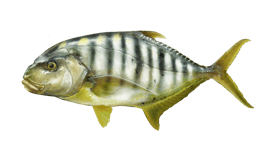 The ideal Permit bait will be live crabs, but sometimes shrimp, squid, conch or cut lobster will be effective. Skilled fishing with artificials also works, of course. 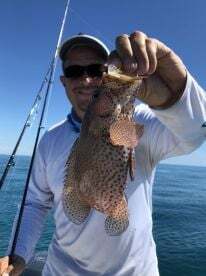 Once the Permit takes the bait, you should wait for a couple of seconds and then set the hook several times, as their mouths are as hard as rubber and it's very easy for them to spit out the hook if there's any slack. 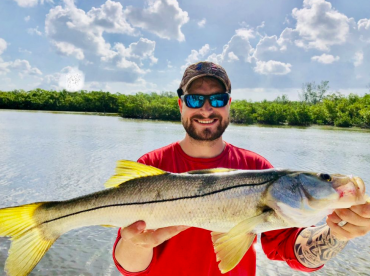 When hooked, the fish will do a long and fast initial run towards deep water, shaking and hitting the bottom head first or rubbing its mouth in the sand in order to get rid of the hook. If there is anything sharp on the bottom, rest asured that Permit will use it to cut the line. 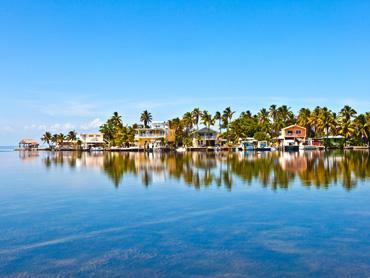 Click HERE to read our in-depth guide to all things Permit-fishing-related. Fish up to 10lbs are considered excellent table fare. 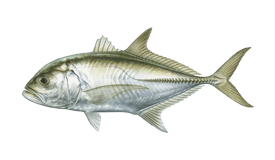 * Spearfishing is allowed in US federal waters.